The Yost 750-DI weighs up to 50% more than the competition. The ductile iron body is 2X stronger than cast iron Vises. Extreme Grip Machinist Jaws feature deeper serrations to grip parts better. Self Align Pipe Jaws conform to the part they are gripping, reducing marring and increasing clamping pressure. 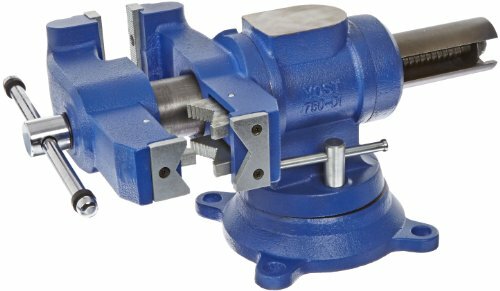 The 360 degree Gear Lock Swivel Base prevents the Vise from turning once it is locked down. The Quick Action Pull pin allows you to rotate the Vise quickly and easily. There are twelve different locking positions. This Vise also features a reinforced anvil and 4 mounting tabs to securely attach it to the work Bench. HHIP 3900-0171 5" Super-Lock Vise for NC/CNC Machines, 13.19"